When Anne Carson was a child, she read Lives of the Saints and adored it so much she tried to eat its pages. The Canadian classicist and poet has never lost this desire to merge with the text; if anything, she’s created forms that allow her to eat as many pages as she possibly can. In her translations and recastings of the classics, she enters the books she loves, tilts and deranges them and makes them her own. Nor has she lost her appetite for the physicality, the thingness, of a book. She eulogized her brother, Michael, in Nox (2010)—a translation (of sorts) of Catullus’s poem 101, his own elegy for a brother—illustrated with collages, photographs, and scraps of letters. The pages folded concertina-style into a gray box, its shape suggesting the self-enclosure of grief and the cold slab of a headstone. In 2012, Carson updated Sophocles’s Antigone, another story of a sister grieving the death of her brother, in Antigonick, a hand-lettered translation with playful drawings and enough creative license to include references to Virginia Woolf and Hegel. Even if one of her books looks conventional, trust that hidden architecture undergirds the story. In her novel in verse, Autobiography of Red (1998), Carson retold the myth of Herakles and his tenth labor: slaying the red, winged monster Geryon and stealing his oxen. She made the two men lovers and narrated their romance in a nonchronological hodgepodge of styles—the academic essay, the interview—the chapters formally different and discrete as rooms. 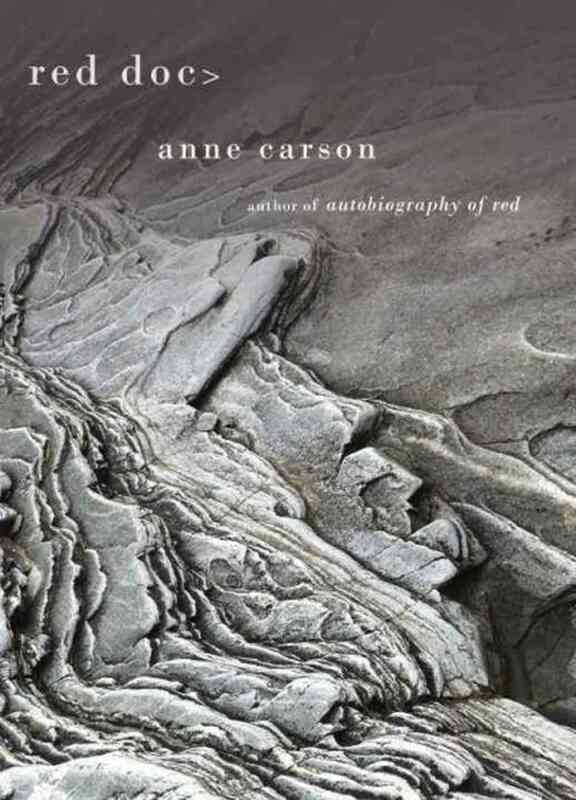 In her new book, Red Doc>, Carson picks up the story of Geryon again, fashioning from it yet another curious object. The sentences are squeezed into a tight column, about an inch and a half long. Scenes are sequential and cut occasionally to witchy pronouncements from a Greek chorus who call themselves the Wife of Brain. Surrounded by acres of white space, the text looks like tracks in snow. In Carson’s work, philosophy and literary criticism (or even their parodies) have functioned as a trellis around which scenes are strung. Formal structures and especially the fragment allow her to pose questions with and within her work, to insinuate and tease, and she’s at her best in the interrogative mood, as in her book The Beauty of the Husband: A Fictional Essay in 29 Tangos (2001). Because Red Doc> lacks this scaffolding, her players skitter in constant and confused motion. This wouldn’t matter so much if the story were strong enough to hold them, if the characters were, on some level, enacting psychological or philosophical questions. But Red Doc> is only superficially interested in narrative. It’s a long, lovely line to nowhere, a beautiful surface. The language doesn’t exist to take us inside the characters; it’s just so many daubs of paint, utterly its own end. “The word conversation / means ‘turn together,’” Carson tells us. But in this book she is never so fettered. She can turn without us, and usually does. Now, we’re on a talk show. Now, in a bat cave (the wonderfully named “Batcatraz”). Now, we’re watching an ox spin in the sky. Dream logic is exhausting, and especially so in this particular form, which forces our eyes to dart so continually across the narrow band of words that we risk going cross-eyed. Comparisons to Autobiography of Red are unfair but inevitable. Red Doc> isn’t pendant to its predecessor. It doesn’t pick up and continue any strands of thought or plot. (Instead, the one event both books refer to—the original meeting of Geryon and Herakles—is represented two different ways. In the first book, Carson writes that Geryon and Herakles met at a bus station, when Herakles stepped off a bus from New Mexico. In the second book, for no apparent reason, it’s Geryon stepping off the bus.) But readers will come to it looking for Autobiography of Red’s tenderness and heat, its many masks, its frank sexuality, and its opinions on the adjective and Gertrude Stein, and they will be disappointed. Nor will they find the careful plait of character and voice: The child Geryon, watching his mother prepare to go out, observes, “She had all her breasts on this evening.” Style doesn’t emanate from the story the same way in Red Doc>, but there are a few lovely instances, as when we enter the consciousness of an ox grazing and warily observing a new herder. “M’hek walks slightly / behind her. He’s not usual. / The wind is from the north. / Usual. / Her head itches. / Usual. She stops and / lowers her head to scrape / one horn against a patch of / gorse.” These pastoral snapshots are the book’s strongest moments (“Ponies in a circle / with noses together and / tails blown straight out / horizontal to the wind”), full of lush, delirious fugues (“Dry / little sound is a bird’s / neckbones sifting into place / to sing”).